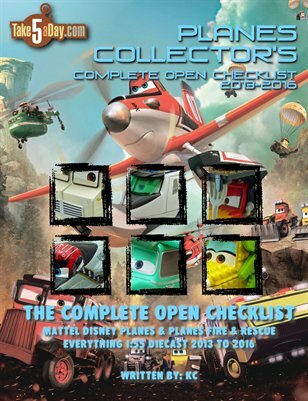 The Everything Open Checklist COMPLETE for Disney PLANES and PLANES FIRE & RESCUE- Every 1:55 scale diecast from both films released from 2013 to 2015! Over 150 photos - all in high res! This checklist shows everything in ALPHABETICAL ORDER and a separate visual checklist if you're only collecting the vehicles of PLANES. Thanks for your continued support of TakeFive with your purchases!